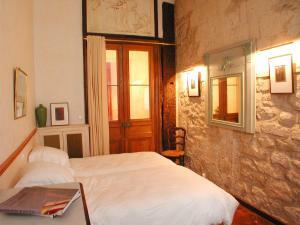 Hôtel Du Jeu De Paume is located on the famous Ile Saint-Louis, a 5-minute walk from Notre Dame Cathedral. It offers contemporary en-suite rooms and there is free WiFi throughout the hotel. The rooms and apartments at this hotel feature hardwood floors, a flat-screen TV and have a private bathroom with a hairdryer, bathrobes and free toiletries. All apartments have a kitchenette, a dining area and a seating area. Guests can enjoy a drink in the hotel's bar and there is also a garden to relax in. Breakfast is served daily and guests can eat in the breakfast room or in the comfort of their own room. 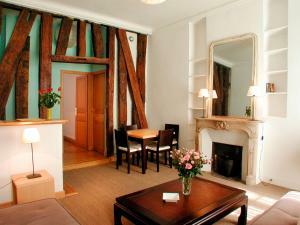 Hôtel Du Jeu De Paume is 300 metres from Pont Marie Metro Station and a 10-minute walk from the Marais district. Saint-Michel Notre-Dame RER Train Station which provides direct access to Charles de Gaulle Airport is a 10-minute walk away. Please note that the credit card used to make the reservation will be requested on arrival. If guests cannot provide the credit card used to make the reservation, the property reserves the rights to cancel the reservation. Please note that payment is due upon arrival. If you wish to pay in cash, please note that a credit card imprint will be requested. The hotel does not accept cheques as a method of payment. Guests are required to show the credit card used to make the reservation. If guests cannot provide the credit card used to make the reservation, the property will reserve the rights to cancel the reservation. Guests are required to show a photo identification and credit card upon check-in. Please note that all Special Requests are subject to availability and additional charges may apply. These air-conditioned rooms have a flat-screen TV, a minibar and a private bathroom. Rate: € 148.50 ... € 214.00; select dates below to get current rates. This larger air-conditioned room features a flat-screen TV with satellite channels, a minibar and a private bathroom. Rate: € 174.60 ... € 244.00; select dates below to get current rates. Located on the second floor, this 2-bedroom apartment offers an open-plan kitchen, a seating area and 2 bathrooms. Please note that daily cleaning is not provided. Located on the first floor, this 3-bedroom apartment offers a mezzanine, a kitchen and 2 bathrooms. Please note that this apartment is accessible by a staircase only. Please note that daily cleaning is not provided. This room features a TV with satellite channels and a private bathroom with a bath, a hairdryer and free toiletries. Rate: € 170.00 ... € 214.00; select dates below to get current rates. This junior suite is split over 2 levels. The lower level has a living area with a TV, a minibar and a bathroom. The upper floor has a bedroom with a TV. The bedroom looks out over the hotel's interior patio. Rate: € 241.00 ... € 294.00; select dates below to get current rates. This suite is split over 2 levels. The lower level features a small living area which can accommodate 2 single beds, a TV, a minibar and a bathroom. On the upper level, there is a bedroom and a second bathroom. Rate: € 317.00 ... € 370.67; select dates below to get current rates.